2016 Jayco Eagle 317RLOK Fifthwheel has an open style designed for comfortable, carefree living. 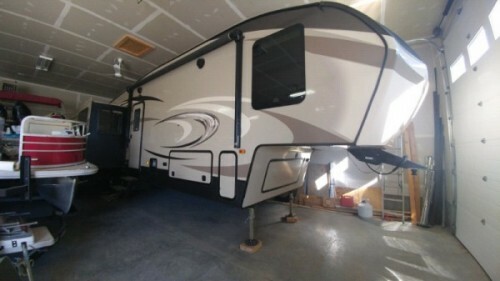 This fifth wheel features an exterior kitchen, a fireplace, table and chairs dinette & sleeps up to 4 people. Start enjoying everything the RV lifestyle has to offer with an amazing unit. 3 Slides with Toppers. Sleeps 4. Power Awning, 4 seat free standing dinette, Leather Sofa with queen hide a bed, Theater seats, Fire place, Flat screen TV, Kitchen Island, Double sink, 3 burner/oven, exhaust vent, microwave, Fridge / Freezer, Sink, Medicine cabinet, Toilet, enclosed shower, queen size Island bed, 2 side tables, Under bed storage, dresser, closet, furnace, ducted AC, Auto levelling system, Solar Panel, Inverter, deep cell batteries. Please call 403-554-2200 to view. 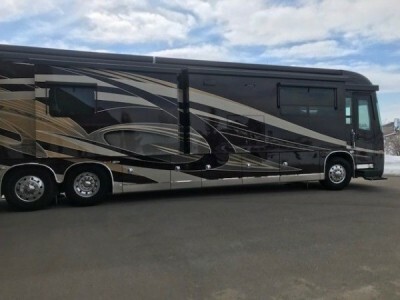 2013 Thor Ace 30Ft Class-C Motorhome. V10 motor. Gas. 25,134 miles. 1 slide. Built-in generator. Sleeps 7 comfortably. Bedroom is located at the rear. 2 tvs. Satellite included. AC and heat. Power awning. Everything works. This is a must for the ultimate camping experience. To view, please contactat 403-502-2086. 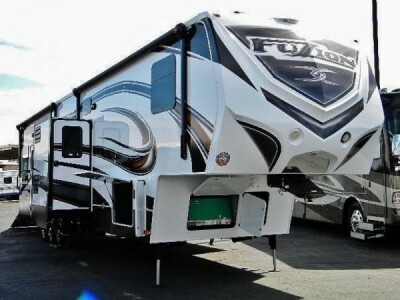 2014 Keystone Fuzion 331 Toy Hauler. Mint condition comes with all the bells and whistles in excellent condition. The family no longer uses the trailer and looking to downsize. 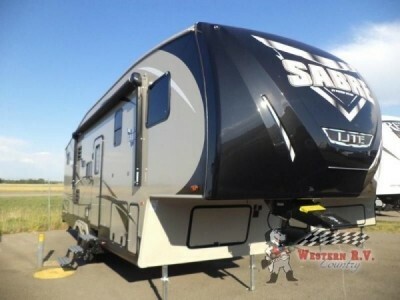 The trailer is an excellent size and weight for a fifth wheel toy hauler. This model is a little easier to pull and park than the more common triple axle models. A great opportunity for the right enthusiast. Please call 780-918-9729 to view. 2007 Winnebago Sightseer 35J Class-A Motorhome. Two roof top AC units, Onan generator, Exterior shower, two slide-outs, king size bed in spacious master bedroom, two bunk beds with TV, sleeps eight people comfortably, rear and side-view camera system, auto level jacks, microwave, three burner stove and oven, exterior stereo, trailer hitch and bike rack. Built on a Ford Triton V-10 chassis, purchased new tires, batteries and windshields last season. Very well maintained and stored indoors during the winter. Please call 780-266-0458 to view. 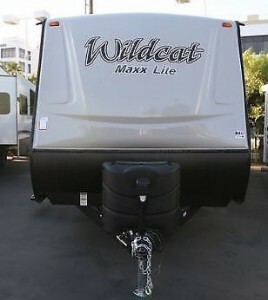 2017 Forest River Wildcat Max 255RLX Trailer. Excellent condition (brand new used 4 times) and the following are included in the purchase price of this tow behind. 2 Large 30lb propane tanks. Upgraded larger batteries. Large solar panel hard wired. Inverter. Briggs & Stratton Generator. Anderson Hitch (plus ball). Custom under-mount spare tire. Rear cargo rack. Exterior paint protection. Spray foam rodent protection. Full size queen mattress. Climatech all weather insulation package. Warranty. Other specs: 1 slide-out, 1 awning, A/C, sleeps 6 (no bunks), interior exterior LED light package, large LCD HDTV and Bluetooth stereo. Bought a Toy Hauler and cannot pull both, but really sorry to let this one go. Please call 403-510-7110 to view. 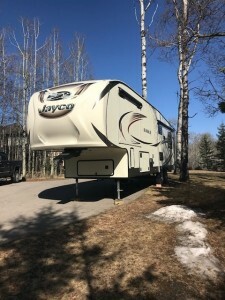 2017 Keysone Cougar MKS333 Fifthwheel. Immaculate condition. It has always been kept in a heated shop and only has been pulled approximately 300 kms. There are 3 large slides, fantastic fan, self levelling jacks and tons of storage inside and out. There are simply to many options to list. Please call 403-382-1059 to view. 2005 Triple E Commander 360IPS Class-A Motorhome. 2 slides, 8.1 Chevy vortex with complete Banks system, new tires, 4 new deep cycle batteries with remote fill on slide out tray, remote air bag control, fridge in basement, aluminum wheels, updated flat screen tv's in living & bedroom, in drawer dishwasher, upgraded residential blinds, central vacuum, passenger computer tray, CB,10 CD player, back up camera, compass/outside temp, Chrome cockpit fans, air horn, 3 power sun visors, safety steer, extra sway bars front and rear, 5500 Onan Marquis gen, 50 amp with EMS 2000 watt inverter with 100 amp charger, 1 solar panel with simplex controller, plumbed for washer/dryer, 18" A&E awning w/t 3 Awnbrella Bowes. Please call 780-850-4967 to view. 2003 Tiffin Pheaton 40ft Class-A Motorhome. Well cared for! 7.5 KW Onan generator. 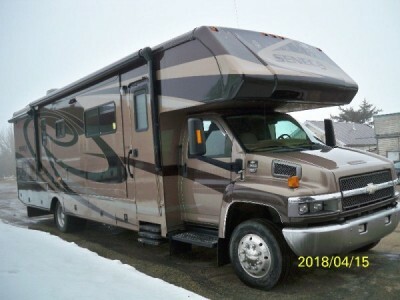 Freightliner chassis, Cat 330HP diesel engine, Alison 6 speed transmission, 50 Amp Service, 2 slides w/toppers, 4 window awnings, TV over dash, 55” 4K TV in the bedroom overtop the dresser. Automatic Shaw roof mounted Satellite , Outside Shower, Power patio awning and door awning. Power entry step and power passenger step cover. Roof ladder. 2 ducted 15,000 btu air conditioner/heat pumps on roof just serviced. 3 powered roof vents, Front and back propane ducted heaters. Back up camera with dash display. Levelling system. Power front windsheild sun screens. Surround sound. Tile/Carpet flooring with special rugged and cleanable Wade carpet in the cockpit. Leather Captains chairs. Simulated leather sofa bed. Simulated leather jack knife sofa. Corian like counter tops with double sink and matching covers. Convection microwave, 3 burner propane cooktop with matching corian covers. Norcold 2 door propane/electric refrigerator with ice maker. Stationary dining table with 2 chairs. Private bathroom w/ toilet, mirrored medicine cabinet with sink cabinet. 2nd sink and large angle corner shower with sky light just outside the bedroom with mirrored medicine cabinet. Dresser in bedroom. Mirrored double closet doors. Combo washer and dryer. Outside BBQ hook up. Must be seen to be appreciated. See photos! This one won’t last long. No tire kickers or low ballers! Serious buyers only! Please call 780-903-0848 to view. 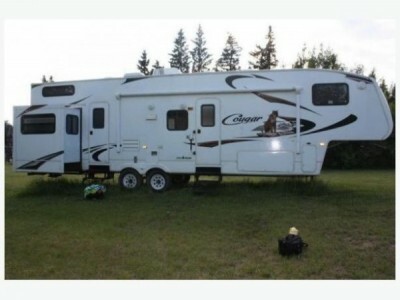 2010 Keystone Cougar 324RLB Fifthwheel. 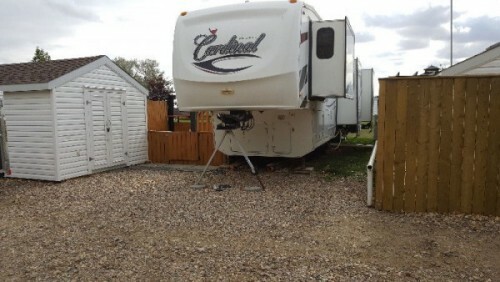 One and only owner, purchased brand new from dealer and traveled one way to Slave Lake Seasonal Lot. Only about 500 Km! No mice, no damage to any of the unit with exception of sun damage to exterior decal on entry side. I would include exterior photo but the unit is at the lake in snow. The decal as you see in this pic is now very worn and maybe replaced by Manufacturer for a cost. Of course, it doesn’t effect the functionality of this luxury camping experience. No leaks. We did replace the converter just a few years ago due to seasonal lot/resort use. No problems with floor or walls. When purchased we added extra railings from Cougar to make the loft safer being so high up as well we installed rope lighting to illuminate the staircase along with on wall switch for child ease. This loft is a fun feature and the kids love it! This is an awesome unit and the living room offers extra floor space for play pens, playroom, teen room, grandma, movies etc..3 slides! It actually accommodates a full size crib very comfortably! Camping with a baby is a breeze! We did-twice! We love this fifth wheel trailer but we no longer need it. Did I mention real wood doors not curtains! Day night blinds. So many features worth having! Can sleep up to 10! Easy! Please call 780-814-6849 to view. 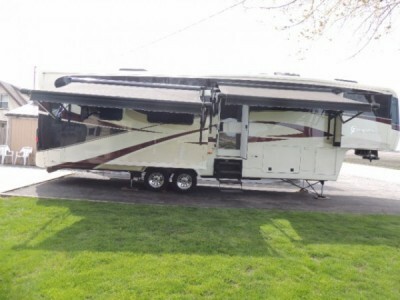 2007 Jayco Seneca 35GS Class-C Motorhome. Duramax 6.6L diesel, 360 HP with Allison transmission, two roof air condition, roof satellite automatic dish, 6000w 3 cyl, diesel generator, 3 slides out, Hydraulic level control, and more. Please call 780-920-4024 to view. 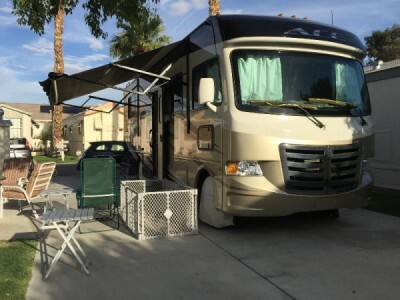 2009 Fleetwood Formula 395SA3G Toy Hauler. Has a 5000 on an on board generator, 1200 hours. Well maintained. Garage makes into a second bedroom, great for company or children. Sleeps 7 comfortably. Reason for selling is would like a motorhome to do a little more travelling with. For more information contact me @ 780-706-8054. 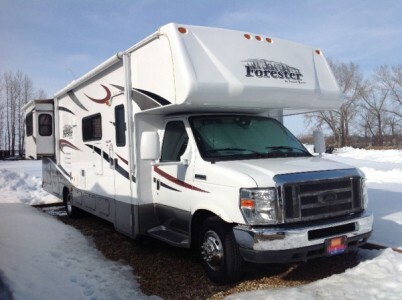 2012 Forest River Forester 3011DS Class-A Motorhome. E450 Ford chassis, V10 motor, 2 slides. Lots of storage, sleeps 6. Onan 4000 generator. Tires new spring of 2017 and have approximately 16000 Klms. Rear bedroom c/w Queen bed, 2 closets and tons of drawers, a built in TV as well as under bed storage. 3 pc bathroom . Kitchen has a lot of upper and lower cabinets, garbage storage accessible from outside as well. 3 burner stove c/w oven and above range microwave. A Breakfast Nook with 2 large storage drawers and also makes into a bed, a flip-down couch and a 40" TV built in to the above cab cabinets. 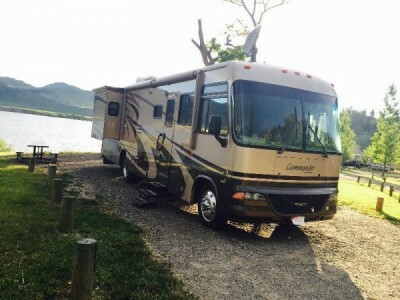 This motorhome is in like new condition, you won't be disappointed. Please call 403-391-2971 to view. 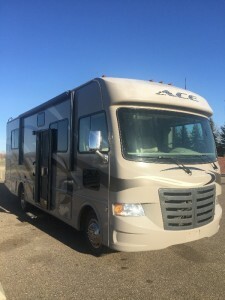 2014 Thor Ace 29Ft Class-A Motorhome. This coach has many extras as you can see from photos. All vents have covers, additional fantastic fan, stainless steel rock guard, major reno to make seating comfortable and to create larger eating area. Handcrafted wainscotting, and new Thomas Payne recliners. Unique stair covers creating more space and extra safety. Please call 403-243-0855 to view. 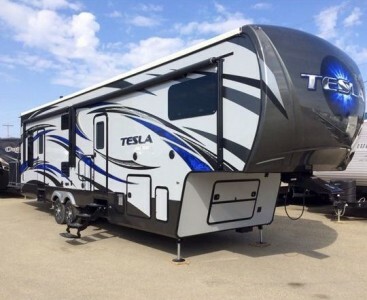 2015 Evergreen Tesla 3212 Toy Hauler. This is a private sale no dealer involved. 38ft long. Double axle. Built in Onan generator with its own fuel tank and electric start from inside the trailer. Separate fuel tank for fueling station with electric pump for toys. Pass through storage compartment in the front. Stereo system that is inside and outside. 2 large power awnings that are adjustable for drainage. 2 entrances. Plumbed in garden hose with spray nozzle (Hot and cold water). Outdoor shower. Self levelling jacks. 2 power slides. Forced vented air (air conditioning and heat). Central vac. Led lights and light strips outside. 4 batteries that are 6 volt deep cycle. Solar panels. Garage. 12 foot garage with roughed in washer and dryer. Garage door has cables so it can turn into a patio. 2 queen size bunk beds in the garage on motors that lift them up so you can drive toys under them. Flat screen in the garage (27” I believe). Kitchen/living room. 4 reclining sears in a pullout. Flat screen in the kitchen (27” I believe). Double doors on a large fridge. Large sink. Corian countertops with a light strip inside them. Oven and stove. Master bedroom. Queen size bed. Large closet in the closet. Large dresser. Access to the bathroom. Slide out for more space. Bathroom. Huge shower with sliding glass doors. And pretty standard toilet and sink. Trailer has seen minimal use possible 6 trips. Has not seen many miles. I believe it still has warranty as we purchased extended warranty but I will look it up and update the post. Please call 780-686-1719 to view. 2016 Heartland Landmark 365 Charleston Fifthwheel. Excellent condition, well maintained, never been in an accident, limited use only by retired couple, clean title, luxury model with many upgrade options including dishwasher, washer & dryer, 5.5kw generator, king bed, backup camera, outdoor entertainment package, power theater seating, safe, electric fireplace, air conditioned, Yeti extreme cold weather package, full extended warranty to May 2022. Price and delivery negotiable. Please call 403-851-9578 to view. 2014 Keystone Outback 310TB Toy Hauler. Great family size trailer. Fits a quad or two dirt bikes. Or storage for bikes, strollers, sports equipment. Lots of storage in master bedroom and room to walk around the bed. Used only 2 seasons. Original owner. Comes with hitch and sway bars. Honda generator will sell with it over and above listed price. Please call 780-919-3173 to view. 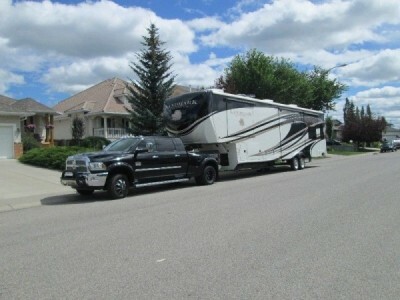 2010 Forest River Cardinal 3450RL Fifthwheel + Lot combo. 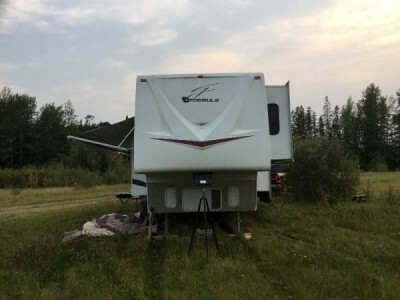 King bed, 4 slide outs, Air cond, furnace, full fridge, 4 burner stove with oven, 2 recliners, sleeps 4, large power awning, table with 4 chairs, stereo system, 2 flat screen TV,s, Lots of storage. Very clean, excellent condition. Set up at King Arthur,s Resort near Vauxhall AB, on a annual RENTED lot. Comes with a 20x24 deck, 10x12 shed finished inside and an Elec golf cart with new batteries. Please call 403-866-5649 to view. 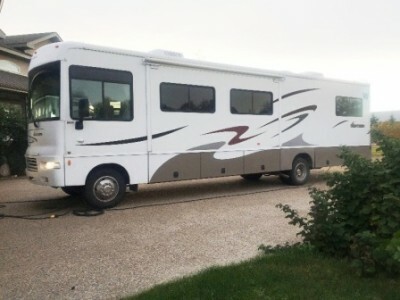 2007 Country Coach Tribute 37Ft Class-A Motorhome. Quality is well above most other RVs. I have many more pictures and video that I can email to you. Financing available. 4 slides. POWERTRAIN: Cat C9 6cyl / 8.8L / 400hp c/w engine brake / Turbo Diesel Allison 3000 MH 6 Speed Transmission. CHASSIS: Country Coach Dyno Tuned DynoMax. Leather power adjustable drivers seat / Leather power adjustable reclining passenger seat. Power sunshade - windshield. Back up camera and 2 side view cameras. Residential grouted tile floor & carpet. Dual pane windows. Pleated blinds. 4 door fridge w/ ice maker. Magnum inverter. changer / player / dvd changer / surround sound. Auto seek satellite. 2 TVs. Solid surface counters. Solid wood cabinets. Convection / microwave. Free standing dinette. 2 Sofa beds. Washer / dryer – removed but comes with the unit. Walk around queen bed. 22.5 aluminum wheels & tires. 8000w Onan diesel generator. Power patio awning w/ wind sensor. Power door awning. Window awnings. Snap on windshield, passenger & driver window shades. Air horn. Slide topper awnings. 1 piece windshield. 2 roof top AC units with heat. dual furnaces. 10 gallon water heater. Auto seek satellite. Multiple storage doors. Full pass through under belly storage with sliding tray. Diesel fill in front of bus and accessible from passenger & driver sides. HWH Auto level air suspension. 88 gallon fresh / 53 black / 69 grey. 32 gallon propane. 100 gallon diesel. New windshield. New 3M. New tires. Serviced less than 1000 miles ago. Please call 780-603-7752 to view. 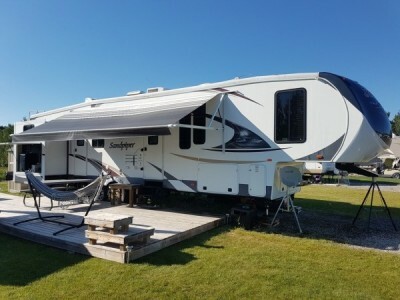 2013 Forest River Sandpiper 365SAQ Fifthwheel. Large quad bunkhouse model, outside kitchen, second bathroom with door to outside, 4 slides, U-shape dining, king bed, large closets, hydraulic front leveling jacks and rear attached propane BBQ. 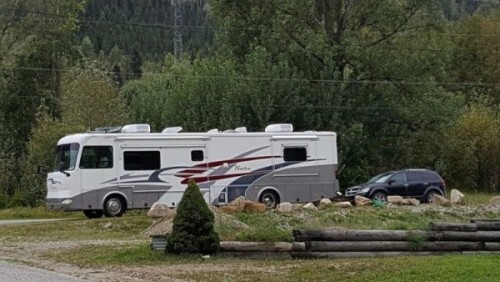 Currently parked at Pine Lake (never moved) and can sell as a package, they lease sites yearly, or if your just interested in a fifth wheel will sell separately. Please call 403-969-7713 to view. 2017 Entegra Cornerstone 45B Class-A Motorhome. Just a few of the Cornerstone standard features includes (3) 15,000 BTU A/C units with heat pumps, (2) power slide-out cargo trays, window awnings, dishwasher drawer, power entry door & baggage door lock with key fob, adjustable foot pedals, 12,500 Onan quiet diesel generator, GPS navigation system, Xenon headlights, 20,000 lb hitch, air horns, dual inverters, automatic leveling system, microwave/convection oven, power cord reel, energy efficient induction cook top, residential refrigerator, fiberglass roof, in-motion satellite (N/A with Travels Satellite option), individual operation of the power day/night shades, power front sun visor, chrome trim package, stackable washer/dryer set, power water hose reel, Aqua-Hot heating system, polished aluminum wheels, frameless tinted safety glass, ceiling fan and MUCH more. If interested, call 403-990-1634. 2016 Keystone Alpine 3591RS Fifthwheel. Purchased new in 2017. Used only 6 months!! 39ft with 5 slides. Touch pad controls most functions including the self leveling jack system. Full size residential fridge, convection microwave and propane range with decent sized oven, double sink in the island. Multi zoned climate control with two AC units. Leather furniture, 2 drop down TVs, fireplace and bose sound system. Queen sized bed, lots of storage, especially in the large bathroom and washer dryer hook up in hall closet. Bathroom has a large shower and skylight. Exterior Diamond coating guaranteed for ten years as well as the leather protector and scotch guarding of interior. Large heated fresh water, as well as grey and black water tanks. Extra large heated belly storage and a large cold storage. This unit is practically brand new, only used for a few months and meticulously maintained. Only reason for selling is that it does not suit our needs. Motivated seller! 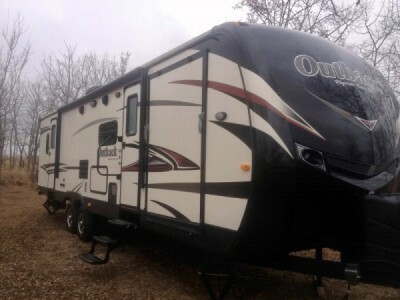 Come take a look at this beautiful trailer and make an offer. Please call 613-876-1258 to view. 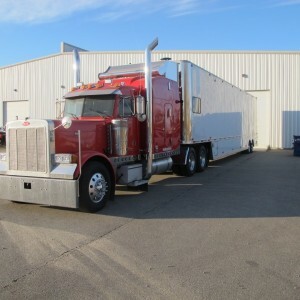 2005 Peterbilt + 1998 Competition Trailer 51Ft combo. 379 Pete, 435 Cat, new rubber, 8" Bullhorns, 2 car storage, office and stainless wing. 1998 Competition Trailer. Completely overhauled. New Brakes, air bags, a/c units, compressor, generator overhauled, rear lift gate has new cylinders, roof resealed, new windows, floor etc. Too much to list. If interested, please call 587-784-6600. 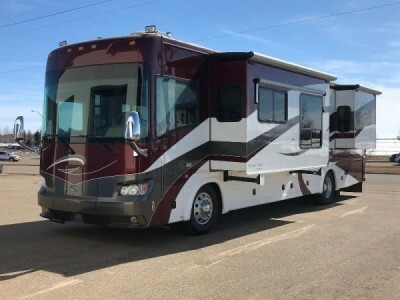 2017 Evergreen Texan 374REBH Fifthwheel. This immaculate unit comes with a rear entertainment area, two bedrooms, full bathroom with shower, toilet, vanity sink, and linen shelf. L shaped kitchen counter with single sink, 3 burner stove, and double door fridge. 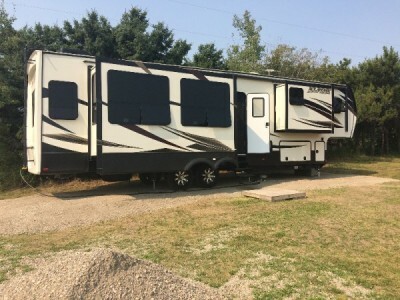 Over $16,000.00 in upgrades include washer and dryer, satellite TV system, tire monitoring system, high end Queen mattress, bunk bed in second bedroom and fully transferable extended warranty until 2023. Only used twice and stored inside during the winter this trailer is pristine. Only reason for selling is I have purchased a house on a lake so no need to go camping anymore. Please call 587-784-6600 to view. 2002 Monaco Knight 38Ft Class-A Motorhome. Road Master Chassis, Sleeps 6, new batteries, Corian Countertops. Cummins 315HP turbo, Alison 6-SP Transmission, Anti-lock Brake System, 100 gal Fuel Tk, 10,000 lb Hitch Receiver, Manual Hyd Leveling Jacks, Full Cushion Air Glide Suspension, Adj Foot Pedals, Exhaust Brake, Chrome Power Control Heated Ext Mirrors, 12V Heated Wet Bay, Alum Ladder, Tinted Dual Thermopane Windows, Air Activated Power Stepcover, Tilt Telescoping Steering Wheel, Rear TV Vision System, 3-way Refrigerator, Convection Microwave Oven, (3) Burner Stove w/ Oven, Hide-A-Bed, fold down Dinette Table w/ benches, Laminate Kitchen Floors, Day/Night Shades, 1500 Watt Inverter, Onan 7.5 kW Diesel Generator w/ Quiet Kit, (2) Flat screen smart TV's, two DVD Players,Cable and Phone Hook-Ups, Electronic Ignition Furnace, Skylight in Bathroom, 6 Way Power Pilot Seat & Co-Pilot Seat, Cold Weather Package, (2) Air Condition Units, Kitchen vent, 4 door refrigerator/freezer with ice maker, 3 slides, New slide awnings. Polished exterior with new Decals. More pictures available on request. Please call 780-717-2729 to view. 2017 Forest River Sunseeker 3010DS Class-C Motorhome. Like new. Satellite dish, 2TV. Please call 403-330-4668 to view. 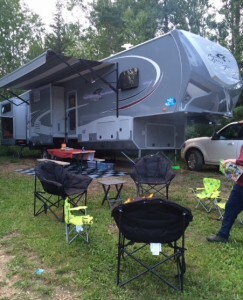 2017 Forest River Sabre 28BH Fifthwheel. MINT CONDITION. Has Two Slides And Sleeps 8 People. Purchased from Western RV World last July and has only been used 3 times. No Smoking and No pets. 2 Bunk Beds that are Double Bed Sized (58” x 72”) in rear bedroom with wardrobe. Master bedroom has slide out dresser and wardrobe, a queen size bed that lifts up for additional storage and 2 night stands. 2 Cooking Areas. L-Shaped Counter with double sinks and upgraded counter tops and sink faucet. 3 burner range and oven. Microwave. Ceiling Fan. Lots of cupboard space. Slide out booth dinette that folds to a double bed. Leather sofa (Tri-Fold hide-a-bed). Entertainment center with 40” Flat Screen TV and full sound system that can be controlled by zones (inside and outside speakers). LARGE bathroom with full size shower, double door linen cabinet, vanity with sink, and toilet. Outside camp kitchen area featuring a two burner cook-top, and single sink and refrigerator. 17ft LED lit fully powered awning. Located in Sherwood Park, Alberta. Come out and see this beauty. Please call 780-965-2624 to view. 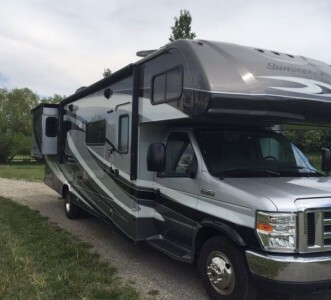 2015 Heartland Landmark 365 Newport Fifthwheel. Top of the line exceptionally beautiful, luxury fifth wheel. This unit is the full-timers choice for residential luxury. As you walk into this luxurious 5th Wheel to the left is the dining area with seating for two, the table also extends to seat four. A high-end upgraded leather loveseat with recliners is a great way to watch the 48” TV in the living room area. Along the back wall is another upgraded leather loveseat with overhead storage the width of the unit. The 5100 BTU Fireplace/Heater keeps you toasty warm and cozy. Kitchen amenities include, induction cooktop, upgraded residential refrigerator, upgraded convection/microwave, and are all you need to make great gourmet meals. Luxurious vanities with oversized sinks and mirrors and a 48” wide residential shower with a mega skylight make this bath and half gorgeous unit warm and comfortable. The upgraded king size Tempurpedic is a great way to wind down and watch your favorite evening shows on the 32” TV/Mirror combo in the bedroom. There is more than $30,000.00 in upgrades in this Top Of The Line Luxurious Fifth Wheel. 4 Year Ultimate Warranty is also transferable to new owners. Please call 403-597-3294 to view. 2011 Carriage Royal International 36XTRM5 Fifthwheel. One owner. Standard package, fireplace, 2-burner electric cooltop, queen bed, white diamond full-body paint, dubai interior decor, all-in-one washer/dryer combo, blackout shades, onan 5500 LP generator, warranty to 2019, 5 slideouts, 2 electric awnings, self leveling jacks, dining table and 4 chairs, max airs on all 3 fan vents, 2 leather recliner/rocker chairs, leather sofa bed, converter and inverter, 2 30000btu air conditioners/heat pumps, 2 TVs, upgraded wood finish. More, must be seen to be appreciated. Please call 519-676-0004 to view. 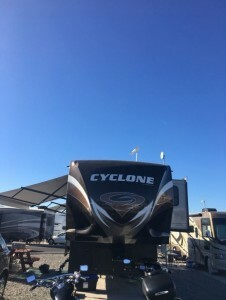 2015 Heartland Cyclone 4100 Fifthwheel. 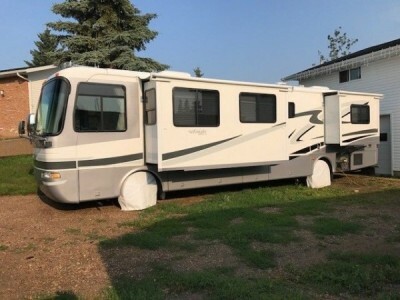 Beautiful toy hauler hardly used looks brand new 2 ac units on it double door fridge full size shower washer /dryer 55000w generator self finding dish and much more call Matt for more info 17808784340 would be interested in trading for a t800 Kenworth of long nose peterbuilt. Please call 780-878-4340 to view. 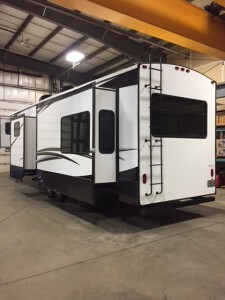 2015 Open Range Romer 384BHS Fifthwheel. Only used during evacuation, never ate food in camper! Sleeps 8 or more. Like brand new. Master bed with queen bed, bathroom off the room. Bunk house with two bunks, one bunk has leather couch on bottom that folds into a bed also has its own bathroom, with door that leads out side. Has put door kitchen and so much more! Call for details! Willing to sell truck with the camper for an amazing price!! Add 45,000 if you want the 2013 Ford F-350 Lariat. Please call 780-715-6187 to view.